Data from the U.S. Department of Education show that African American schoolchildren of all ages are more than three times more likely to be suspended and expelled than their non-Hispanic white peers. American Indian/Alaska Native, or AI/AN, youth are similarly overrepresented in school discipline data: They account for 0.5 percent of total enrollment but 3 percent of total expulsions. While all boys account for two out of three suspensions, girls of color are also overrepresented in the remaining one-third of suspensions. African American girls are suspended at a rate that surpasses boys of nearly every racial group with the exception of African American and AI/AN boys. Likewise, the suspension rate of AI/AN girls outpaces that of non-Hispanic white boys. At the same time that many states and communities across the country are committing to expanding high-quality early learning opportunities, alarming statistics suggest that early childhood learning environments are a point of entry to the school-to-prison pipeline, particularly for African American children. Preschoolers—children ages 3 to 5—are especially vulnerable to punitive and non-developmentally appropriate disciplinary measures. A national study by Walter S. Gilliam found that preschoolers are expelled at a weighted rate of more than three times that of K-12 students. Furthermore, while African American children make up only 18 percent of preschool enrollment, they account for 42 percent of preschool suspensions. Comparatively, non-Hispanic white preschoolers make up 43 percent of enrollment but 28 percent of preschool suspensions. The practice of suspending and expelling children—particularly those younger than age 5—from early childhood settings can have profound consequences. These punitive measures come at a time when children are supposed to be forming the foundation of positive relationships with peers, teachers, and the school institution. Instead, they are experiencing school as a place where they are not welcome or supported, which serves as a troubling indicator of what is to come. Research shows that when young students are suspended or expelled from school, they are several times more likely to experience disciplinary action later in their academic career; drop out or fail out of high school; report feeling disconnected from school; and be incarcerated later in life. 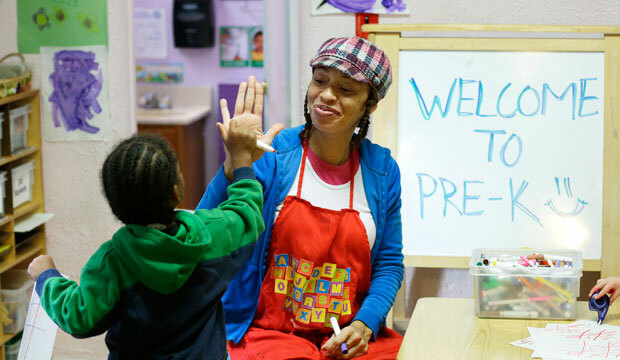 This report highlights the trends around preschool discipline. It first details the interconnected factors that augment these trends, including the rise of zero-tolerance policies and mental health issues in young children while also exploring some of the factors that cause suspensions and expulsions. These factors include the implicit biases of teachers and school administrators and how these biases affect their perceptions of challenging behaviors; the lack of support and resources for teachers; and the effect of teacher-student relationships. Finally, this report will provide recommendations and approaches to increase the protective factors available to ensure that young children stay in school and reap the full benefits of early learning while simultaneously supporting schools and teachers to actively resist the criminalization of African American youth. High-quality early childhood education has the potential to improve long-term life outcomes for all children—particularly those born into challenging circumstances such as poverty. In order for students to learn, however, they have to actually be in the classroom. As such, it is time to change the nation’s approaches and actions related to school discipline. Maryam Adamu is a Research Associate for the Early Childhood Policy team at the Center for American Progress. Lauren Hogan is the former vice president for programs and policy at the National Black Child Development Institute, or NBCDI.